Roomy enough:great compartments for various things, DSLR camera, 2 lenses, flash, phone, chargers, tablet, etc. Comfortable, Casual, Practical and secure storage for gadgets. The Messenger Bag for SLR Cameras and Accessories offers multiple storage options for your camera, lenses, cables, IPads and other accessories. 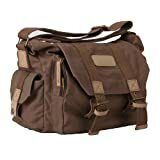 This durable coffee Canvas messenger bag features three interior compartments to store and protect your equipment. For further convenience, foam dividers let you adjust and even remove the compartments according to your needs. The roomy and padded camera compartment provides protection for gear and the adjustable divider system makes for easy customization. Three separate compartments give you quick access to your camera, lenses, lights & other gear. The Velcro dividers can simply be removed or relocated anywhere within the bag to fit the kit you require it to carry. Moreover, the interior can be removed and you can just use the bag as a travel bag. Our messenger bag features a front zipped pocket for storing your IPAD. For your convenience, there are also two side pockets for storing other accessories or even camera lens. Heavy-duty buckles and zippers are made for long lasting use in any condition. Light padded straps make this Messenger bag comfortable to carry, even when it’s filled with your equipment. Canon EOS, PowerShot, IXUS / Nikon D Series, Coolpix / Sony, Pentax, Fujifilm, Olympus, Cameras etc. This entry was posted in Discount Photography and tagged Backpack, Camera, Canon, Canvas, Case, Casual, Digital, DSLR, Gadget, Insert, iPad, Magazine, Messenger, Nikon, Organizer, Outdoor, Photography, Pocket, Portable, Profession, Shockproof, Shoulder, Sony, TOPMAX®, Travel by Ball Photo. Bookmark the permalink.